Most navigation will be handled using the Navigation Menu located on the left side of the screen. By default, it is in the collapsed view, where just the navigation icons are displayed. To expand to the full navigation pane, use the left/right arrow button icon at the top of the navigation bar. 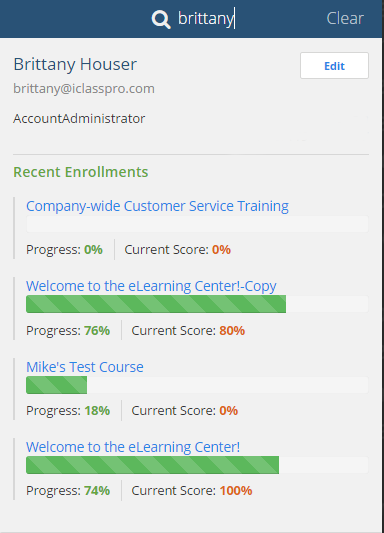 Home- Welcome message and user’s enrolled course information. Course Catalog- View the current course catalog. Admins can access a list of published courses or all courses for editing. Files- Upload or access files for general reference and use. 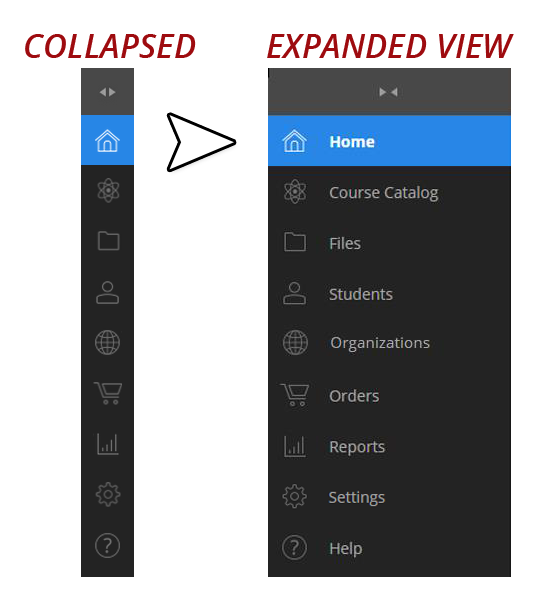 Students- View existing users or register a new one. Orders- View, search, and sort order history. Reports- A list of available reports for courses. Settings/Admin- Administrator settings which control account branding, messages, payment information, email templates and course categories. Help- Easy in-account access to our help files. Additional navigation options and filters may appear under each of these pages at the top of the screen. In the colored page header of iLearnPro, a built in super search tool can be used to search for students and courses. This tool is available to every user, but searches differently depending on the role of the user. Account Administrators- will be able to search the whole account. Organization Managers- will be able to search courses and students. Users- will be able to search only courses. As soon as text is entered into the search field, results will begin to populate.